One of the most complex characters I have ever seen graced the screen of my Samsung TV, yesterday. There was self-loathing, self-help, self-incrimination ... a depth of character yet, a void of character ... spiritual bankruptcy, the ramblings of someone on the edge of a serious breakdown ... and then ... there was the Royal "She". 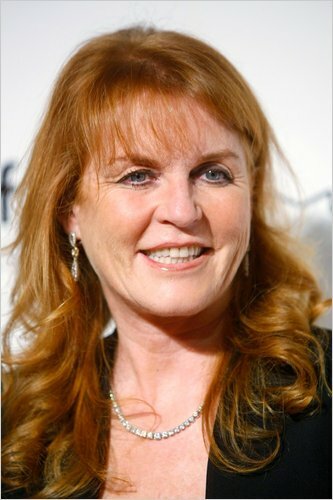 Something that has been floating around the media as of late is the latest attention grabbing headlines surrounding Sarah Ferguson, the Duchess of York. In an apparent sting operation, the original "Fergie", was caught accepting a bribe of £500,000 in exchange for access to her ex-husband Prince Andrew. The story was first reported on by News of the World. Of course, as per usual, Oprah hopped on the Fergie Train and secured an interview which aired yesterday. Truth be told Friendlies, Oprah had to work damned hard to keep that Fergie Train on the tracks as she was bobbing, weaving and jumping all over the place. We viewers were taken from confusion to pity to anger to "huh?" ... and all the while, Oprah kept the interview moving and kept trying, sometimes in vain, to get Fergie to explain herself. Let me break it down for you: you have an ex-royal who has lived in palaces and dined with kings, queens and movie stars - then, after her marriage fell apart, she went to work as a spokeswoman for Weight Watchers, as a writer of children's books and as a philanthropist for various charities. Yet, as with many people brought up in that kind of environment, the question is inevitably asked of them: "What do you do next? How are you going to make money?" "Friendship with the boss?" What-in-the-hell kind of friendship is that when you're constantly treated like the red-headed step child? Literally. This is crazy-talk! Even though she could end up the Queen Mum someday (I know it's not likely, but still it *could* happen), apparently that's only worth $1600 a month. You know ... this is where the Royal Family shows how out of touch with reality they are. They've got an ex-royal who is known throughout the world, is in the press constantly and can bring scandal to Buckingham Palace faster than a bullet train - you'd think they'd give her more that $20,000 a year in hopes that she'd stay out of this kind of trouble. That's just an act of responsible PR. You never want to have a destitute royal running around. Fergie is so destitute, in fact, that she has had to take up residence with Andrew (in her own room, of course) because she can't afford the payments on her own home. Say what you will - I feel like the Andrew / Fergie relationship is more than what we think it is. Look, we've all lost our minds at one time or another and have taken risks which made us look like we're about as smart as a box of hammers. If you haven't had that opportunity yet, you will at some point. For Fergie, the stakes are higher as her lapses in judgment, unlike yours and mine, are more public and are reported on the moment they happen. Fergie is moving forward, trying to pick up the pieces and make sense of what she's done. I just didn't think that she would be *trying* to make sense of what she's done right in front of our very eyes. My heavens - that interview was a doozie! Maybe it's time for Fergie to have her own reality show on OWN - The Oprah Winfrey Network. I can just see it ... Fergie: The Un-Royal Royal.